Almost exactly two years after Sarasota County commissioners voiced worries about an agreement for a Kimpton Hotel on county-owned property at 20 N. Washington Blvd. in downtown Sarasota, the board this week formally terminated an Invitation to Negotiate (ITN) process for the 41,595-square-foot site. The unanimous vote came without discussion as the commission approved its Jan. 26 Consent Agenda during its regular meeting in Sarasota. A Jan. 26 memo to the board from Lin Kurant, manager of the county’s Real Estate Services Department, and Public Works Director Isaac Brownman explained the background of the situation, including the inability of county staff to obtain detailed documentation it sought on the latest proposals for the property. 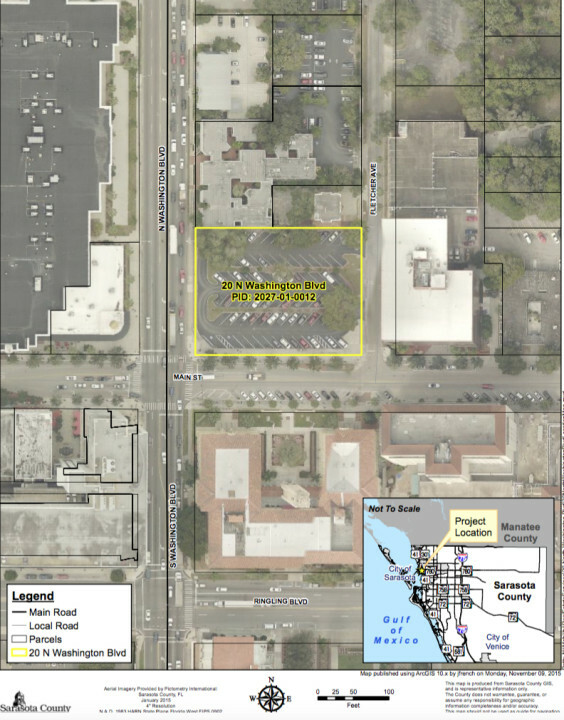 On July 10, 2013, the County Commission voted to declare the parcel across from the historic Sarasota County Courthouse to be surplus land. Eight days later, staff published an ITN on the county’s Procurement Department website and on its Real Estate Services webpage, the memo points out. The commission directed staff to negotiate a deal with SHD Partners. Less than four months later — Feb. 12, 2014 — the commissioners voted 3-2 to approve Connelly’s plan, which called for constructing the hotel within 18 months after the closing on the Washington Boulevard parcel. The developer would pay the county $958,862, which was $2.6 million less than the county’s most recent appraisal of the land prior to that session. In exchange, SDH Partners agreed to construct 86 parking spaces at 2051 Main St. and give that property to the county. The Main Street land was valued at about $2 million. 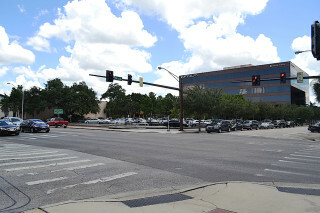 The County Commission also agreed to pay SHD Partners up to $494,798 to convert the Main Street site to a parking lot. However, then-Commissioner Nora Patterson and Commissioner Christine Robinson voiced discomfort over the lack of an enforceable provision in the contract that would require SHD Partners to carry through with its plans. The Jan. 26 staff memo points out that, ultimately, SHD Partners “failed to meet the terms and conditions” of that agreement, which was terminated on May 1, 2015. Then, in July 2015, county staff published a second ITN, using its Real Estate Services webpage once again and its new procurement system, BidSync. It also put the notice in local newspapers; in the online newsletter of the National Association for Industrial and Office Parks; and in industry publications targeted at construction firms and Realtors, the memo explains. Staff even erected a “For Sale” sign on the site. One of those new plans came in from SKC SP LLC, whose team included Civix. Like the SHD Partners’ proposal, it called for a hotel on the site and an effort to acquire the parcel at 2051 Main St., where it could construct 86 parking spaces. After the Main Street deal was completed, the proposal said, SKC SP would swap the Main Street site with the county, and construction would get under way on North Washington Boulevard. The completion date would be Aug. 1, 2017. The second response was from HAAD/ARCADD Inc., which proposed an eight-story mixed-use structure that would feature a Starwood Hotel on the top three floors; 16,400 square feet of retail space on the first and second floors; office and commercial space on the middle levels; and underground parking for more than 100 vehicles, with 86 slots reserved for county use. That proposal had a completion date of Dec. 1, 2018. After staff contacted both firms and asked for more information, the memo continues, staff still did not receive “adequate financial information detailing how [either] project would be funded” or about their potential economic impacts on the community. Both respondents did indicate they would be willing to adjust their models “to ensure the County parking requirements were satisfied (including purchasing additional property,” the memo points out. Still, neither has “a concrete plan in place at this time,” and neither has modified its economic impact analysis, the memo says.